Wake up call, buffet breakfast. 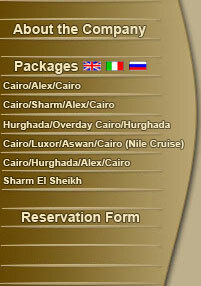 Proceed to visit Memphis and Sakarra lunch at the Pyramids area then continue the visit to the Pyramids and Sphinx. Back to your hotel. Wake up call, buffet breakfast. Shuttle bus to the airport for a short flight to Hurghada. Arrive Hurghada and check in. Wake up call, buffet breakfast. Free day or you can enjoy Snorkeling in the Red sea. Wake up call, buffet breakfast. Free day or you can visit Safaga 60 km South Hurghada where you find fantastic coral reefs. Wake up call, buffet breakfast. Shuttle bus to airport for a short flight to Alexandria, check in hotel, at night free shopping. Then back to the hotel. Wake up call, buffet breakfast. Proceed to visit the Greco Roman museum, Pompeii’s Pillar and Catacombs. Free day at night. Overnight in the hotel. Wake up call, buffet breakfast. Then proceed to visit and the Roman theatre, Jewelry museum and Fort of Quaitbay. Back to hotel.